While I’m a Moldbug fan and like some of his concepts, I think that Moldbugian critique of progressivism is wrong for a number of reasons. If the Puritan Thesis were correct, then if one subtracts the contributions of Jewish leftists, the trajectory of the West should be comparable to what it is today, but this seems highly unlikely, which means that the Puritan Thesis is too simplistic. Second, it is true that Puritans have been a little more leftist than other Anglo groups. David Hacket Fischer’s Albion’s Seed well documents the contributions of the four major Anglo folkways in the United States (Puritans, Cavaliers, Quakers & Scots-Irish). While the Puritans are more leftist than the Cavaliers and Scots-Irish, the Quakers might actually be more leftist than Puritans, since the Puritans have vacillated in their causes. While the Puritans might well have caused the American Civil War (their greatest failing in my opinion), Puritans were also some of the most adamant to demand repatriation of blacks after the Civil War. Furthermore, the greatest president of 20th century, Calvin Coolidge, was of Puritan stock. It was Coolidge who in fact passed the Immigration Act of 1924, which limited immigration both in numbers and to Europeans. This type of patriotism would hardly be found among America’s New Elite (the Ashkenazis who have replaced the WASPs in America’s elite institutions – Yale now is less than 20% WASP). In fact, the New Elite seem overwhelmingly to support open borders (for the West, not Israel), as evidenced by George Soros, Sheldon Adelson and Mark Zuckerberg, to name but a few. Furthermore, it was the early 20th century people of Puritan stock (e.g. Madison Grant and Lothrop Stoddard) who took Darwinism to its logical conclusion and championed the idea of racial differences, and who were opposed by people like Franz Boas. Third, many neoreactionaries mean “Puritan” as a shorthand for Protestant (and seem somewhat hostile toward Protestantism, wanting to blame all the West’s problems on Protestantism) but there is no evidence that Protestants today are more leftist than Catholics. If Protestantism were the cause of modern-day leftism, it seems that modern-day Protestants should be more leftist than Catholics – but they are not. First, in the United States, the voting patterns of Catholics are considerably more leftist than Protestants. Second, Catholic countries have a much higher rate of Marxism than Protestant countries (think of mestizos in South and Central America, or even Southern Europe). Third, and most importantly, outside of Jewish groups, the Catholic Church today supports the Third World immigration invasion of the West more than any other religious organization. In short, the Catholic Church today is actually calling for the genetic destruction of Western Civilization. In fact, the Catholic Church is so vehemently in favor of mass non-white immigration that some European traditionalists have recently begun to wonder whether Catholicism is just as big of a threat to Europe as Islam. Fourth, I wonder whether any of the neoreactionaries championing the Puritan Thesis have ever read Nietzsche, Spengler, Benoist, et al. If one wants to talk about long-term cladistics, then what you have is not a Puritan problem, but rather a Christian problem. As Spengler noted, “Christian theology is the grandmother of Bolshevism.” The Christian idea of the “universal brotherhood of man,” some have maintained, is the fons et origo of all modern-day leftism. In short, the problem is not with Puritanism per se but with a deeply held Christian mindset, which is much older than Puritanism. Nonetheless, even if this Christian thesis is correct, it seems highly unlikely that our current trajectory would be the same but for the Jewish leftist movements of the past 150 years. In conclusion, the origins of modern-day progressivism are complex. While Christianity (not Puritanism) might be a part of the cause, leftist Jewish intellectual movements certainly are too. There are probably other causes as well, such as pathological altruism and ethnomasochism. Instead of committing to a dogmatic ideology (“Puritans and Protestants caused everything bad”), which is something leftists do, it’s better to keep an open mind and realize that the problem is much more complex. Here at Occam’s Razor we have previously discussed elements of the Dark Enlightenment / Reaction with the posts “What are Characteristics of the Dark Enlightenment?” and “The Laws of the Cathedral“. Now reader Zith Met has made the following contribution explaining what he thinks these elements are. Neoreaction, also known as the Dark Enlightenment, is primarily a critique of modern liberalism. It is a reaction to the growing oppression of the left and the increasing ineffectiveness of the US and other Western governments. It is not based on mainstream American conservatism–instead, it is defined by an attempt to use science and reason to uncover basic rules which govern human relations. Where modern liberalism sees humans as blank slates molded by society and free will, neoreactionaries see people as governed by incentives and their own inherent natures. This outlook unites such disparate areas as HBD (human biodiversity), economic commentary, and anti-democratic political theory. 1. All human traits are heritable. 2. Racial and ethnic groups form genetic clusters. 3. Genetic differences result in varying frequencies of behavioral traits between racial and ethnic groups. 4. Human evolution can be relatively fast, and even populations without significant migration can change significantly over the course of hundreds of years. 5. People are naturally happiest around others with similar traits. Trust and other positive community attributes decline with increasing diversity. 6. People with different psychological traits tend to have different political preferences. 7. Culture, including politics and morality, is largely a manifestation of the collective traits of a group of people. Society is not an accident of environment or history, but a result of the actions of people in that society. 8. IQ and other traits with strong genetic bases such as aggression levels explain most inequality between nations. 9. Racial inequality within the US is attributable to genetic factors rather than structural, institutional, or other forms of racism. 10. Favoritism toward one’s own group, known as clannishness, is an example of a trait that varies between racial/ethnic groups due to historic breeding patterns (particularly levels of inbreeding or outbreeding) and selection pressures. 11. Northern Europeans have evolved low clannishness due in part to a high degree of outbreeding historically encouraged by some forms of Christianity. 12. Low clannishness leads to progressivism/universalism, which is based on the idea that all groups of people are fundamentally equivalent, and so they all should be treated equally. The Cathedral refers to all institutions that promote this and suppress any contrary views, particularly universities and most media sources. 13. In-group preferences are a prisoner’s dilemma. A homogeneous, universalist society with low in-group preferences tends toward the optimal outcome (cooperation). 14. The introduction of more clannish people into a society with low clannishness results in a move away from the optimal outcome of the prisoner’s dilemma (defection). People who favor their own group have an advantage over those who don’t. 15. The defection problem can be resolved by suppressing clannishness and promoting assimilation or by adopting one’s own clannishness and promoting separatism. Note that each solution is prohibited by the Cathedral’s multiculturalist ideology. 16. Technological changes (the robot economy) are reducing the need for labor. This is increasing inequality and causing society to move in the direction of neofeudalism. Socialism is one possible response to this. 17. Socialism is fundamentally incompatible with open borders. 18. Open borders create externalities in the emigrant countries–pressures that would prevent those peoples from overpopulating the land under their control are removed. 19. Open borders also result in intelligence declines in first-world countries. Societies with declining intelligence will have a hard time supporting their people and maintaining their standard of living. 20. Many socialist policies also promote dysgenic breeding and a resulting decline in the intelligence of a population. 21. Affirmative Action and other racial preferences can be viewed as political spoils, so we may expect racial preferences in the US to grow stronger as minorities increase in number and power. 22. Institutions tend to grow, ossify, and become increasingly fragile over time. Eventually, complex systems collapse. 23. A functional society keeps incentives, human nature, and society’s needs all in accord. Modern society does not, leading to anomie, atomization, economic malaise, and misery. How will the Cathedral deal with Nicholas Wade’s new book? Fewer ideas have been more toxic or harmful than the idea of the biological reality of race, and with it the idea that humans of different races are biologically different from one another. For this understandable reason, the idea has been banished from polite academic conversation. Arguing that race is more than just a social construct can get a scholar run out of town, or at least off campus, on a rail. Human evolution, the consensus view insists, ended in prehistory. Inconveniently, as Nicholas Wade argues in A Troublesome Inheritance, the consensus view cannot be right. And in fact, we know that populations have changed in the past few thousand years—to be lactose tolerant, for example, and to survive at high altitudes. Race is not a bright-line distinction; by definition it means that the more human populations are kept apart, the more they evolve their own distinct traits under the selective pressure known as Darwinian evolution. For many thousands of years, most human populations stayed where they were and grew distinct, not just in outward appearance but in deeper senses as well. Advanced copies of the book have already been sent out, and quite a bit of commotion is beginning to build. Given Wade’s popularity in scientific journalism and that fact that his previous books (e.g. Before the Dawn: Recovering the Lost History of Our Ancestors) have been best-sellers, how will the Cathedral deal with this book? What strategies will the Cathedral utilize to address it? A. Try to criticize the actual arguments of the book and discredit them. A few might try unsuccessfully to do this, but given the fact that the evidence for human biodiversity is becoming overwhelming, I doubt many will even try. B. Try to ignore the book. The Cathedral is able to do this for lesser-known authors, but Wade is fairly mainstream and widely read. This strategy will probably prove futile. C. Point and sputter “racist,” etc. I’m sure many journalists will utilize this tactic. Who knows, maybe some journalist will discover that Wade once stayed at the same hotel as some politically incorrect figure, and by association of whom journalists will attempt to smear Wade. They’ll grasp for whatever straws they can find. D. As Gregory Clark recently advised, the Cathedral could admit there is genetic inequality and instead of focusing on inequality focus on poverty. The initial shock of publicly admitting HBD is real would be great, as it would invalidate all the lies told over the past 75 years, but people would get over it and the Cathedral could shift gears and find other justifications for its pet projects. Nonetheless, I don’t see the Cathedral taking this route, as any acknowledgement of HBD would undermine its legitimacy. E. Be honest, admit HBD is true, and let the chips fall where they may. Yea right! Except for E, probably a little of all the above, but mostly C, I predict. As you notice, we’re listed in the above post. Our cover is blown. With the impending pressure that will be brought upon us both from the Sith Lords and the Cathedral, we had better make our exit now. Outside In has more here. The cat is out of the bag: Shea knows it was a hoax. But was it? Confession time: I am one of the authors of the above letter. Why? Mark Shea is so ridiculous and the temptation was too great. The fake letter can serve as the template for the secret society we’re in the process of forming: The Sacred Order of the Aurochs. More fun to come…. .. But keep it top secret or you’ll be punished by the Eldar! Damn, they’ve already figured out our smoke screen. Important: Now that Operation Smokescreen has been thwarted, Operation Weasel is in effect. HBD Chick has volunteered to give phenotype inspections. Best Of Tweets: here, here, here, here, here, here, here, here, here, here, here, here, here, here, etc. Rod Dreher doesn’t have a sense of humor. Mark Shea’s funny tags. And derp enters the lexicon. OK, the “DERP Excellence in Recruiting” Award has been proposed. The Legionnaire summarizes Shea hoax. Evolutionary psychology comes in to explain why some kind of morality is natural, since we can’t rely naively on an Aristotelean teleology which we now know has no empirical basis (but which, I cannot stress enough, Aristotle thought was scientific – I feel pretty confident that, were he alive today, Aristotle would be making precisely the same move). But much of the edifice of Aristotle’s ethics can be readily re-built on a Darwinian foundation. Now we have a theory of virtue and human flourishing, and an ethics to promote same within society. Between Aristotle and the neo-Darwinians, we’ve also probably got a Burkean bias towards existing institutions and arrangements and a preference for spontaneous order over imposed rules. Minus Millman’s predilection for J.S. Mill, I have long thought along similar lines, and have in fact argued similar points (here, here, and here). I’ve long thought that Aristotle (foremost a biologist) in his political and ethical writings was working along the same intuitions as a sociobiology ethicist would today, albeit with Aristotle’s more limited understanding of human science. But there is a larger problem here. Call it the “Western blind spot”. As automobiles have blind spots, so do biological Westerners, and this blind spot is “universalism,” the tendency to prescribe Western norms universally. And this is the primary problem with evolutionary psychology today — the tendency to think evolution stopped from the neck down some 50,000 years ago and that all races are behaviorally and cognitively the same. Anyone who has taken the time to look into human biodiversity, knows this simply isn’t and cannot be true. Thus, it’s better to think of human natures (plural) and not human nature. Call this the HBD caveat, which brings us back to Aristotle, who, in his Politics, essentially gives an HBD account of politics: different ethnic groups are better suited for different forms of government. I’m late to this party, but Matt Sigl’s “The Dark Enlightenment: The Creepy Internet Movement You’d Better Take Seriously” has piqued mainstream interest, along with Scott Alexander’s Anti-Reactionary FAQ, Klint Finley’s “Geeks for Monarchy: The Rise of the Neoreactionaries,” Bryce Laliberte’s “It’s not racist to seek an ‘exit’,” and Jason Kuznicki’s “Zombie Apocalypse or Marginal Revolution?” (and here, here, etc.). As I’ve noted previously, the Dark Enlightenment, largely an American phenomenon notwithstanding Land, has much in common with the European archeofuturist or identitarian movement, although the later is less influenced by libertarianism (perhaps for the better). The Laws of the Cathedral. Obey or Perish! A. Human nature is a blank slate to be written upon by the Laws of the Cathedral. B. Evolution exists but only insofar as it is a club to beat up on religion. Otherwise, the logical conclusions of evolution (such as meaningful racial or gender differences) must be silenced. All group differences must be ignored. No cognitive or behavioral differences between groups exist; evolution occurred only from the neck down. C. Homosexuality has a genetic cause but only homosexuality is heritable. Everything else (like violence, intelligence or stupidity) is the result of culture. D. Race does not exist…except when it does. For non-whites, racial pride, racial resentment, racial organization and the excuse of racism for all their failings are permissible. For whites, race does not exist; it is a cultural construct. Behaviorally and cognitively, all races are identical. Remember the decree: neck down! E. Gender does not exist in any meaningful way. There are no substantial differences between the genders because, well, they don’t really exist…except when they do. Feminism is permissible, but that’s it. Behaviorally, genders are identical. Remember the decree: neck down! A. Democracy and only democracy is acceptable — and it must be based upon an American model replete with fast food, regime change, and globalization. B. Real power must never be discussed, especially the disproportionate power of one small, particularly powerful group of genetically related people. In fact, these people shouldn’t even be discussed, let alone named, so let it be decreed that they be called the Unnamed. C. Immigration is bad for certain nations (like a small enclave in located at the eastern end of the Mediterranean but should never be named in this context, and the people of this unnamed nation, Universalis decrees, are permitted to sterilize and deport undesirables). For Western nations, however, immigration is a gift of Universalis. To question its good is to partake of evil itself. 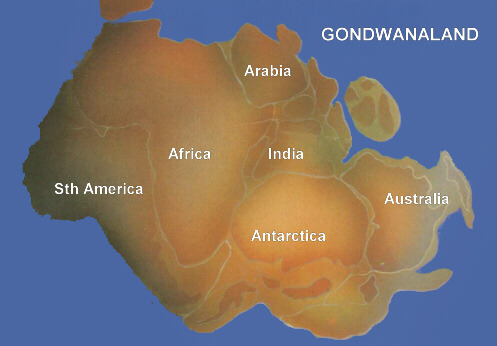 Open your borders to the teeming hordes of Gondwanaland or suffer the wrath of Universalis! D. Europe and Western Civilization in general, and white people in particular, are responsible for most of the world’s ills and should almost always be discussed in derogatory terms. The racial organization of these people is never, never, never allowed. Capiche? E. War is bad, well, unless it’s used to crush dissenters who in some way oppose the Laws of the Cathedral; then, war is liberation. People are thirsty for freedom and some people hate the Cathedral for the freedom it offers. D. Progress is good, unless it involves evil concepts like eugenics or the notion that some races are better adapted to civilization, then the Noble Savage is good. F. All mass media and entertainment should present images contrary to reality. Human nature is evil; the dictates of the Cathedral, good. A. Ethno-Religion, i.e. identitarian religion, is permissible for certain groups of people, but never for European descended peoples, who must always subscribe to deracinating, universalist forms of religion. B. Religion is generally bad, unless it’s the religion of non-Europeans, or unless religious leaders are fighting for the Cathedral (such as in supporting immigration or opposing racism). So let these laws be decreed, let them be obeyed. And let those who disobey them be hunted down like witches, ruined financially, and humiliated beyond measure. Long live Universalis! So it has been spoken. Let the world listen. This is a rough draft and work in progress. It is also a group project, which potentially includes you. Let the spirit of Universalis inhabit you and please leave suggestions in comments below (to improve upon current laws or to add new laws) and your suggestions might be added to the next edition of the Laws of the Cathedral. What is the New Creationism?